The newly enhanced Freedom of the Seas® is a marvel of maritime engineering, packed with awesome innovations to stir your imagination. Share a high five with Shrek as part of The DreamWorks Experience. Catch a first-run movie in the 3D theater or poolside under the stars on the outdoor movie screen. Infuse color into your cruise with the artworks from our Art Gallery or with the frosted confections of the Cupcake Cupboard. And finish the evening with a selection of reds or whites at the renovated, now-more-intimate Vintages wine bar. Learn more about how now our best ship is every ship! 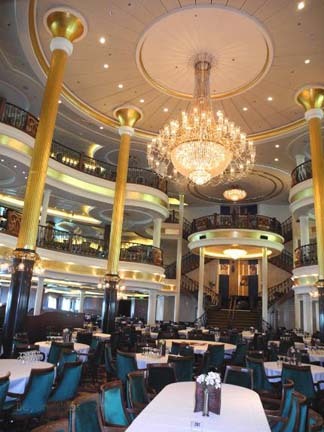 Scroll down to see info and photos of the Royal Caribbean Freedom of the Seas. The Freedom-class family is a litter of vessels that began with Freedom of the Seas in 2006 and ended with Independence of the Seas in 2008. 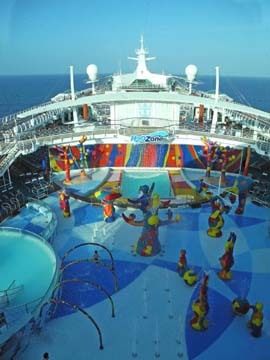 The ship, one of the largest cruise ships in the world behind the Oasis-class twins, boasts all the Freedom-class favorites, including popular onshore brands like Johnny Rockets and Ben & Jerry's, "Center Ice" skating and show rink, a rock-climbing wall, the novel "Promenade" concept, and Boleros Latin lounge. Royal Caribbean has introduced a ship in Freedom of the Seas that offers vast options in the areas of fitness, recreation and entertainment. With the sheer number of options onboard (especially if the seas are calm), you may find yourself forgetting that you're actually on a massive floating object, gliding quickly through the Caribbean Sea. In 2011 and again in 2015, Freedom underwent dry dock renovations. 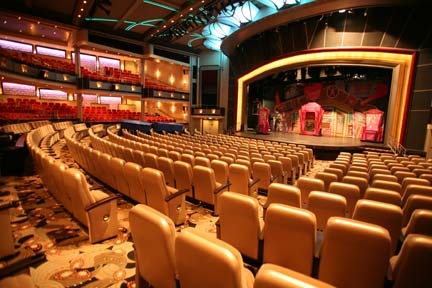 During the multimillion dollar refurbishments, the ship gained several features that debuted on Oasis of the Seas, including a cupcake bakery, big-name stage show, a nursery for the youngest cruisers and an outdoor movie screen. New technology knowhow is paraded in the form of interactive in-cabin televisions and the addition of digital deck plan systems, which are located throughout the ship to help passengers navigate with the use of LCD touch-screens that offer customized directions and routing, real time updates and ship factoids. 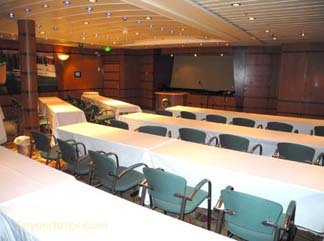 This comfortable conference center features state-of-the-art presentation equipment and a variety of meeting rooms. 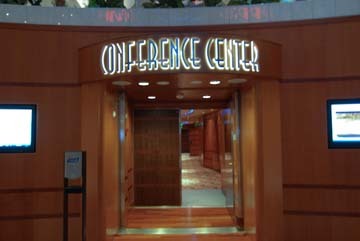 Our main meeting room for our Intuition Expo and seminar-at-sea will be located in this conference center. For a 5-night cruise, 3 casual nights, 1 smart casual night, and 1 formal night. 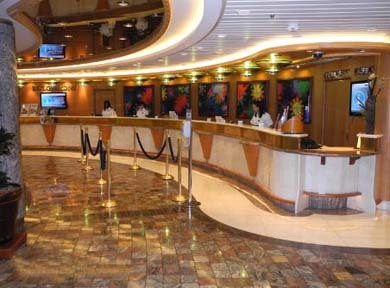 For a 7-night cruise, 4 casual nights, 1 smart casual night, and 2 formal nights. 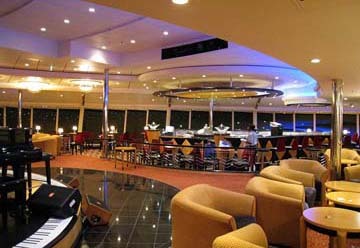 For an 8-night cruise, 4 casual nights, 2 smart casual nights, and 2 formal nights. For formal nights, quite a number of men choose to wear tuxedos for formal dining, though dark suits were more common. Women are typically found in cocktail dresses or gowns. 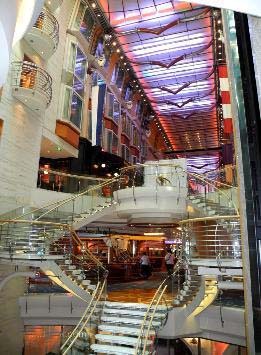 On five-night cruises, there is just one formal night. 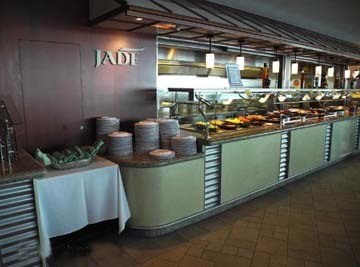 However, it is not compulsory, and many choose not to participate and dine in Windjammers buffet or Jade buffet to avoid the formal attire. 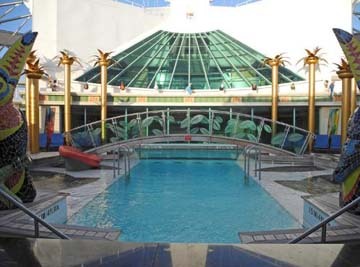 Royal Caribbean passengers are charged $13.50 per person, per day ($15.95 for suite guests). 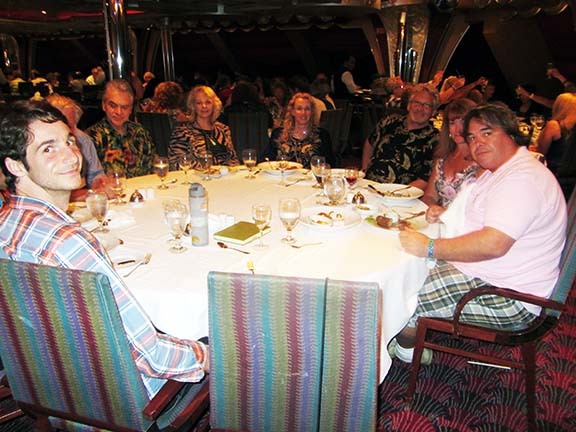 Gratuities are prepaid for large groups such as ours. So your gratuities were already paid when you were charged for the cruise. Passengers can modify or remove gratuities by visiting the guest services desk while onboard. A 15 percent gratuity is automatically added to bar tabs. This includes info about the ship schedule, dining, entertainment, spa and fitness, special events, lectures, port information, shore excursions, shopping, and more. CLICK HERE for a sample. Every room on Royal Caribbean Freedom of the Seas has an interactive TV to give you up to date information about what is happening on the ship. The TV interfaces with your SeaPass account so you can book shows and shore excursions at the touch of a button. 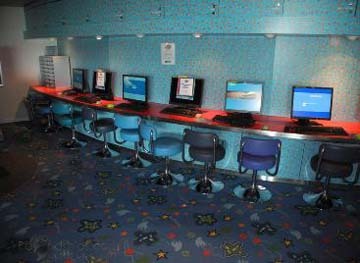 You can access a variety of electronic commerce services such as previewing and reserving shore excursions, watching on-demand movies and informational videos, ordering room service, enjoying games of chance, and reviewing your SeaPass account and shipboard activities. Royal Caribbean's RCTV offers at least 29 channels of in-room television programming fleet-wide, including satellite channels such as CNN International and ESPN International; TNT; Cartoon Network & Boomerang; Discovery, featuring the best of the Travel Channel, The Learning Channel, Animal Planet and Discovery Channel; Bloomberg TV; CNNfn; CNN Espanol; and two movie channels that play recently released theatrical films before they hit the premium cable circuit. 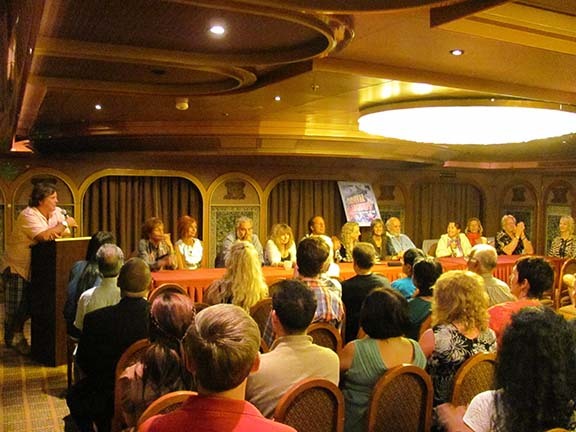 In addition, Royal Caribbean has developed many channels exclusive to the cruise line that offer a variety of hand-picked shows in the lineup, including classic TV shows on Retro TV; current sitcoms and dramas on Family TV; classic movies on Royal Classics; and music videos and E! Entertainment TV programs on XYtv, Venus TV with programming including daytime drama soap operas, and E! & Style network shows geared to women. 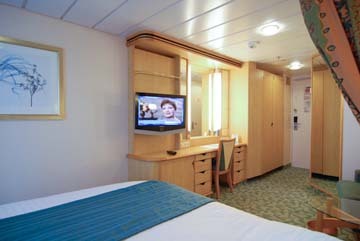 When crowds on deck or in public areas become overwhelming, you can seek solace in your stateroom. If you want a blissfully quiet experience, book a stateroom where the laundry room, elevators, or other noisy public facilities are not within earshot. If you are traveling with the family, minimize your stress by booking a Family Cabin. 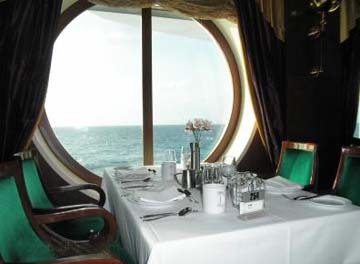 Balcony staterooms or suites make for an idyllic retreat, with extra living space inside and a private verandah outside. 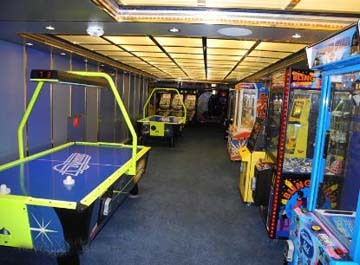 In addition, passengers in suites get several amenities that make their vacation more relaxing. Retreat to the glass-canopied, adults-only Solarium pool, where inspired surroundings, a light-fare cafe, and whirlpools promise the ultimate in relaxation. Rent a private cabana for a few hours, or claim a lounger in an adults-only section of the deck. 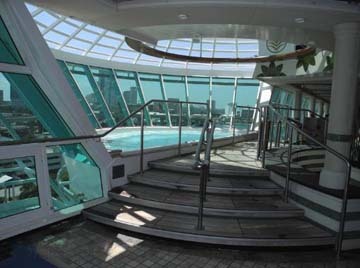 Visit one of the unique cantilevered whirlpools, extending 13 feet beyond the side of the ship for a unique at-sea perspective. Vist the Vitality Spa, a luxurious sanctuary boasting signature treatments, medi-spa services, and a full-service salon to make you glow from the inside out. Find peace at the well-stocked library, featuring a variety of genres, plus tables for cards and board games. The outside strolling area (along the jogging track) is a great place to read or nap. Get free room service for breakfast in bed or lunch/dinner on your private balcony. 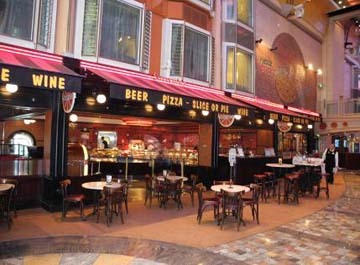 Or visit one of the specialty restaurants for a quiet ambience. If you eat meals during off-peak hours, the main dining rooms and buffets will be significantly quieter. 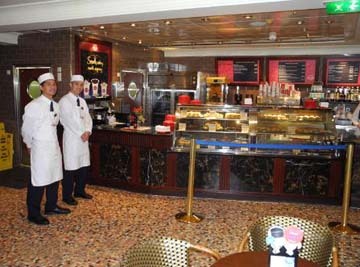 Try the main dining room for breakfast or lunch, rather than fighting crowds at the buffet. On cruise line private beaches, rent a private cabana where you can have some space to yourself and perhaps splurge on a massage. Plus, having a place to shower, change and store your stuff will keep your island visit hassle-free. On port days, stay on the ship to avoid lineups for tenders and jam-packed beaches and souvenir shops. 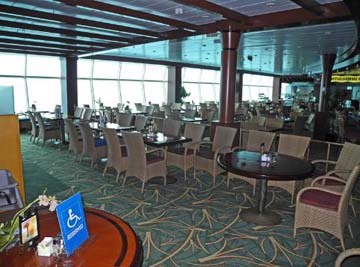 On a sunny shore day when everyone else is off the ship, retreat to the spa, sit by the pool in a perfect spot, and enjoy nearly empty dining rooms. 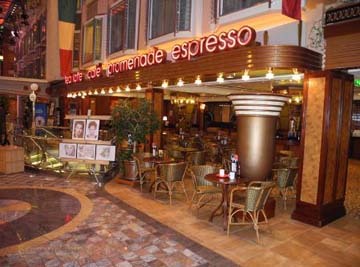 The Royal Promenade is designed like an indoor suburban shopping mall, with shops, bars and eateries lining a four-story corridor running the length of the ship. The area stays busy on sea days and in the evening, with stores open till 11 p.m. 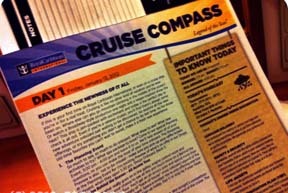 Fliers for merchandize and sales arrive in your cabin daily. A variety of name-brand, duty-free shopping includes jewelry, perfumes, apparel and shopping for teens and kids. The jewelry store features watches, jewelry, sunglasses, amber jewelry, Swarovski crystals, accessories, handbags, leather products, and clothing. 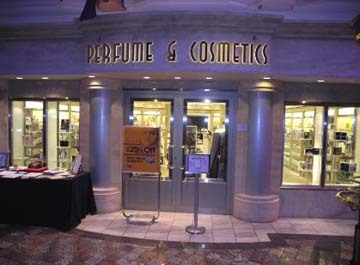 The Perfume & Cosmetics store covers most of the big brands. At the Logo Souvenir shop, there is plenty of Royal Caribbean merchandise, t-shirts, teddy bears, mugs, thermos bottles, plus Freedom of the Seas model ships, as well as resort wear. Also a small selection of sundries, including sun block, tampons, pain relievers, toothpaste, and so forth. The General Store carries duty-free liquor and cartons of cigarettes, to be collected during final debarkation off the ship. Also paperback fiction titles, snacks and candies, more sundries as well as a few oddball items, like a hand-held luggage scale, luggage locks, and walkie-talkies. 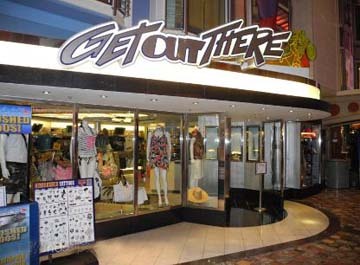 A shop called Get Out There has active wear watches, sunglasses, clothing, hats, flip flops, shoes, outdoor sunblock, and resort wear. 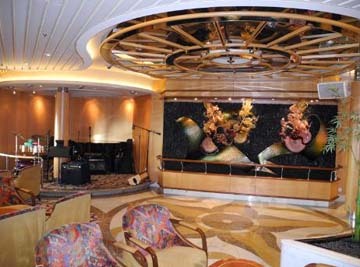 At the popular "Art Auction At Sea" where you can purchase collectible art while onboard your cruise. Reportedly, several companies that run art auctions onboard cruise ships will provide an appraisal with their art that will lead you to believe that you are getting very good value. There are those with opinions that the appraisal methods are questionable. So, if you are inclined to buy something at one of these auctions, a common sense approach to avoid feeling like you got ripped off is to never buy thinking you will make a profit, buy the art because it suits your tastes and budget. 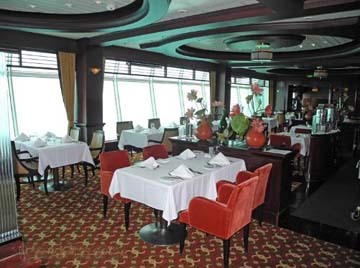 The world-class food and decor in the main dining rooms makes them the perfect choice for groups both large and small. From heavenly entrees to delectable desserts - and dining options to suit a range of vacationing needs - this is fine dining that everyone can enjoy. 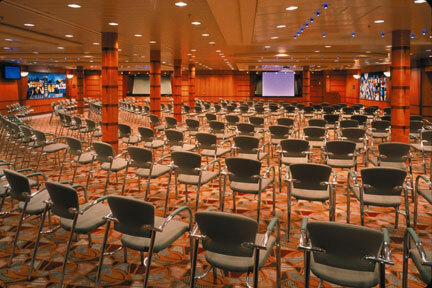 Our Intuition 2017 Cruise and Seminar-at-sea will have our own assigned seating area in the Main Dining Room for dinner. You will be able to sit anywhere within that area each night. Our dining hours will be "early seating": 6:00 pm to 8:00 pm nightly. We suggest arriving early so you can enjoy the company of other Seminar participants and Speakers. Chops Grille is a guest favorite, the perfect place to celebrate a special occasion or simply be treated to a fantastic dinner. 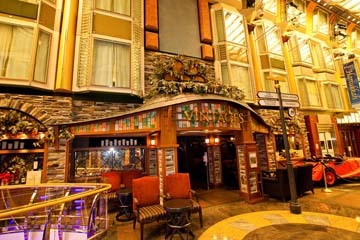 Enjoy juicy steaks, fresh seafood, hearty side dishes and delicious desserts in an elegant atmosphere. From filet mignon to mesquite-grilled salmon, Chops Grille offers much more than simple meat and potatoes. In the mood for a slice? Enjoy traditional favorites topped with cheese and pepperoni, or go for something new such as Chicken and Potato, Chorizo, or Frutti di Mare pizza. Get the family together for good old-fashioned burgers and fries. 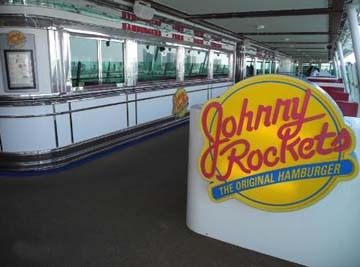 The Johnny Rockets restaurant you'll find onboard is everything you'd expect from the shoreside restaurant - authentic 1950s decor, a menu filled with all-American favorites and, of course, friendly service. Johnny Rockets is a great casual dining alternative that everyone in the family will enjoy. Sprinkle some sweetness into your cruise at this adorable 1940s style shop featuring fresh-baked gourmet cupcakes, with a new cupcake flavor showcased every day (including bubble gum, strawberry, red velvet, root beer and more). Private decorating parties and cupcake-design classes are also offered. 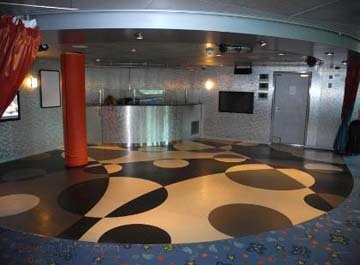 The gorgeous view isn't the only thing that will dazzle you onboard your cruise ship. World-class performers from all over the globe star in awe-inspiring original shows by Royal Caribbean Productions. It could be a contemporary stage production or a Las Vegas-inspired floorshow, a headline musical act, or a fast and loose live comedy show. No matter which show is on stage, one thing's for sure - it'll leave you cheering. 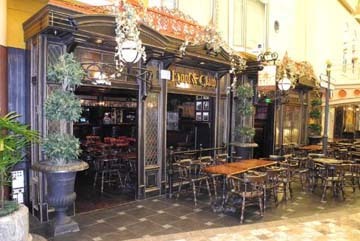 You'll think you've popped "across the pond" as you lift a pint of ale at The Hoof and Claw English pub. Stop by for a low-key get-together and sample the wide variety of imported beers and ales. Experience Vintages, the first-ever wine bar at sea. Together with Robert Mondavi, Beringer Blass Wine Estates and Niebaum-Coppola, Royal Caribbean has created a first-rate wine bar everyone can enjoy. The menu includes a range of options from some of the best wine-producing regions in the world. You can also take part in a wine tasting class. Casino Royale is a little bit Vegas, a little bit Monte Carlo. 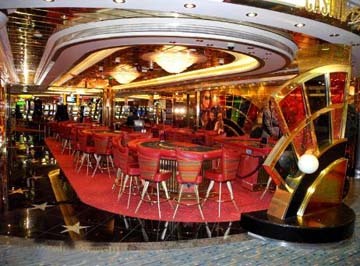 Featuring all types of table games and close to 300 slot machines, there are games for all levels of players. Come try your luck. Follow the sounds of the Latin beat and you'll find yourself in Boleros, a Latin-themed club and nighttime hot spot. Cool off with one of the refreshing specialty drinks, like a mojito or caipirina. And for those who can keep up with the live Latin music, the dance floor is all yours. 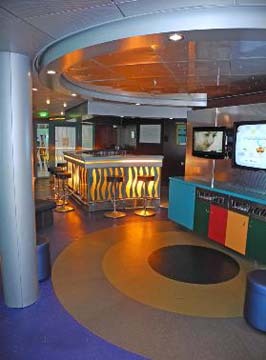 No Royal Caribbean cruise is complete without a stop in this signature lounge on Deck 14. Perched high above the sea, this glass-enclosed stunning lounge is possibly the best place onboard to enjoy a cocktail and watch the sun rise or sest. Step into the spotlight and sing your favorite songs. It's a chance for Liberty's most gifted guest singers to battle it out for the title of Karaoke Superstar! You won't believe your eyes when you step into Studio B. 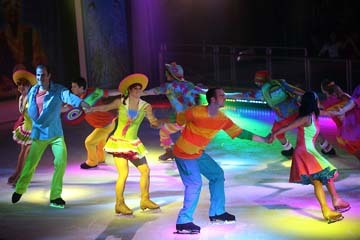 It's where you'll find the onboard ice-skating rink and professional ice shows, which are a "must-see." 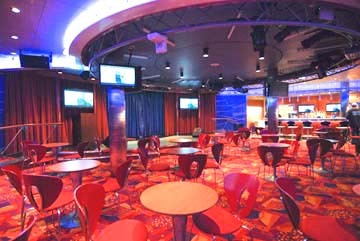 Studio B is also home to onboard game shows, onboard parties, cooking demonstrations, and more. 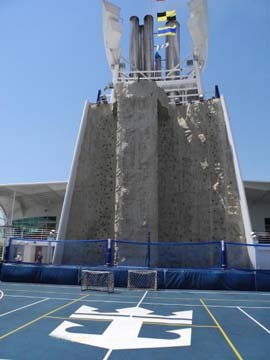 The signature rock climbing walls are the most popular feature on a Royal Caribbean ship. Whether it's your first time on a rock wall or you're a seasoned climber, there are challenges for all levels of experience: Deck 13. 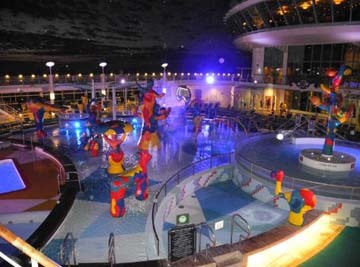 Only Royal Caribbean gives you the chance to surf onboard a ship. 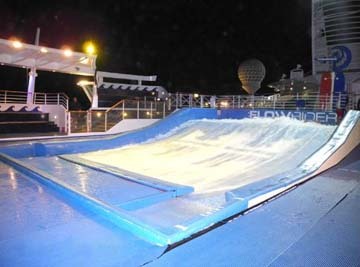 The sloped, wavelike surface of the Flowrider is perfect for beginning, intermediate and advanced surfers: Deck 13. 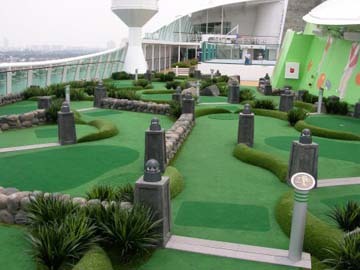 If you just can't wait to get onshore, you can pick up a quick golf game right on the ship. The small course doesn't allow for long drives, but it's a great place to perfect that short game: Deck 13. The H2O Zone integrates colorful sculptures around a series of sprinklers, jets and water cannons that guests can use to soak each other. 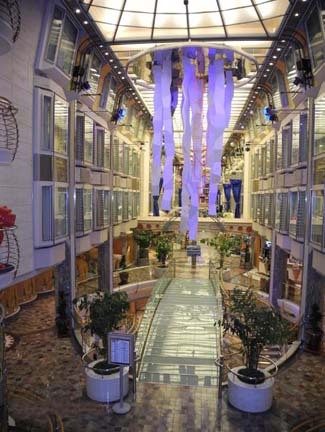 In the evening, it transforms into a beautifully lit sculpture garden: Deck 11. The onboard fitness center on Deck 12 features the best equipment, saunas and whirlpools, and all the latest classes, like yoga and pilates. Plus, the full-service spa offers a beauty salon and spa treatments including massage, manicures and seaweed body wraps. Visits to the sauna and steam room are totally free! Set aside some special family time onboard and join in the fun of our Royal Babies interactive classes held in one of the onboard lounges. These enriching activities have been developed by early childhood experts at Fisher-Price and are hosted by trained youth staff. Note: a parent or caregiver MUST accompany children 6 to 36 months of age during all activity sessions. Join your child in the fun of Royal Tots, interactive playgroup sessions developed by early childhood experts at Fisher-Price. 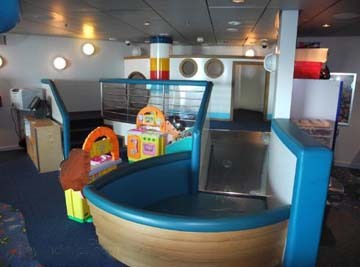 Each 45-minute session, held in one of the onboard lounges, offers activities that expose children to new experiences and teach you how to make playtime learning time as well. Plus, your little one will be all smiles and giggles as they make new discoveries, sing, sway and play with great toys they're sure to love. Note: a parent or caregiver MUST accompany children 6 to 36 months of age during all playgroup sessions. Your Aquanauts' time onboard will not only be fun, it will be educational too! They'll get to learn about local customs, do cool science experiments and make great new friends. 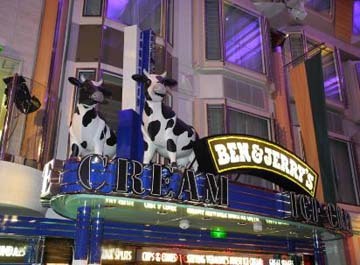 To participate, children must be fully potty-trained* and 3 years of age as of the first day of the cruise. You can rest assured your little ones are in good hands - every member of the Adventure Ocean youth staff holds a college degree in education, recreation or a related field and has experience working with children ages 3-17. Note: no diapers or pull-ups, please. One thing you won't have to worry about during your cruise adventure is a bored Explorer! All kinds of exciting activities await your 6-to-8-year-olds, like hands-on science experiments, scavenger hunts, theater games, and more. You can feel confident leaving your children with the Adventure Ocean staff because every member holds a college degree in education, recreation or a related field and has experience working with children ages 3-17. The Voyagers program is all about kids having a great time, learning new things and making new friends from all over the world. And you can be confident that your children are in very capable hands - every member of the Adventure Ocean staff holds a college degree in education, recreation or a related field and has experience working with kids ages 3-17. The best thing about the Teen program is that it's not structured. Guests 12- to 14-years-old guests can come join activities and games when they want to, or just chill with friends in the teen-only lounge. And parents don't have to worry, because every member of the teen staff holds a college degree in education, recreation or a related field and has experience working with youth ages 3-17. The teen program isn't some structured set of classes or rules. Teens have the freedom to choose their activities. They can join events all day, or come and go as they please. There are great laid-back hangouts where they can just chill with new friends. Or dance, listen to music and hang out at the Teens-only disco.